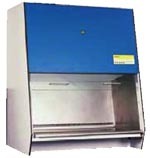 UNO Microbiological Safety Cabinets have a workopening allowing the user to perform operations in the workspace. The design is so that the user is protected and the risk of product- and cross contamination is minimilized. Also the escape of airborn particles is minimilized by the internal airflow in the cabinet and by the filteration of the exhaust air. 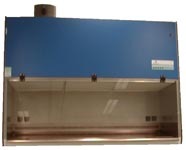 The filtrated uniform downflow in the workarea minimilizes the risk of product- and cross contaminination. An aircurtan is generated at the front of the workspace, thus maintaining the product- and personell protection. The air flow out of the cabinet goes through the recirculationcanal, at the backside of the cabinet. All areas that the contaminated air is directed through are maintained under underpressure thus making leakage from contaminated air into the surrounding areas impossible. * All cabinets can optionally be supplied with static or moveable frames!